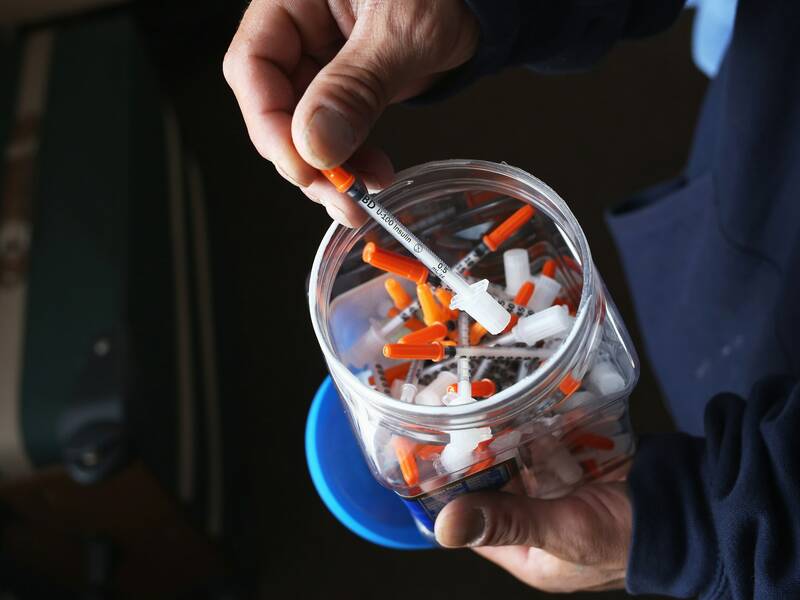 A drug user takes a needle before injecting himself with heroin in New London, CT. Communities throughout New England and nationwide are struggling with the unprecedented heroin and opioid pain pill epidemic. THE OPIOID CRISIS has hit Indiana hard. In 2012, Indiana was among a handful of states whose opioid prescriptions roughly equaled its population. Three years later, intravenous drugs caused the nation’s worst HIV outbreak in two decades, affecting 181 people in rural Scott County, Indiana. And since 2013, Indiana has had the dubious distinction of leading the nation in pharmacy robberies, beating even California, which has six times its population. Disturbing as those numbers are, Shah says understanding the data and blending them with data from other government agencies is critical to fighting the drug crisis in Indiana and elsewhere. That’s why earlier this year, Indiana launched an online opioid data center, where police departments, hospitals, pharmacies, mental-health agencies, and others contribute data to help policymakers better see the big picture and not just its piecemeal parts. The effort has been driven in large part by the state’s new governor, Eric Holcomb, who succeeded Vice President Mike Pence in January, ascending to office on a promise to address the state’s drug crisis. Working with the analytics-software provider SAP, Shah’s team built a database that includes information on drug arrests, drug seizures, death records, pharmacy robberies, overdose-related ambulance calls, and the use of naloxone, an overdose-reversal drug. Officials also tapped data-visualization tools from Tableau, so agencies providing the data can log in and observe trends over time. Terry Cook, assistant director of Indiana’s Division of Mental Health and Addiction, says the state’s investment is already paying off. When officials were deciding where to locate five new opioid- treatment facilities earlier this year, Shah’s team combined a map of the existing treatment facilities with a map of overdoses and instances where paramedics administered naloxone. Then, they measured the distance between overdose hotspots and the nearest treatment facilities to identify gaps where the new clinics might be most effective. “Before, everything was always in the rear-view mirror,” Cook says. “We needed a large-scale view of what’s going on now.” Cook’s team is also keeping a close eye on drug seizures to track new drugs hitting the market. In 2013, for instance, Indiana’s forensics labs saw 27 cases of seized fentanyl, an opioid that’s much more potent and deadly than heroin. In 2016, it was more than 600, Shah says. Indiana officials didn’t need a fancy database to know that use of fentanyl was growing, but having access to that data in the moment, not months or years down the line, could help the state identify new drug outbreaks before they reach crisis levels. Researchers have been calling for this kind of data-driven approach to the national opioid epidemic. They want to study the spread of opioids like infectious diseases, by looking at transmission patterns and recovery rates. But much of the data is locked in state agencies, making it difficult to access, says Donald Burke, dean of the Graduate School of Public Health at University of Pittsburgh. “These data should be liberated,” he says. At the same time, Burke says funding for the federal agencies that sponsor this kind of research—the National Institute of Drug Abuse, the Drug Enforcement Agency, and the Substance Abuse and Mental Health Services Administration—has fallen over the last decade. The Trump administration has proposed further cuts. “There’s plenty of political blame to go around,” Burke says. In order for researchers like Burke to adequately study the epidemic, states will need to encourage more data sharing. Indiana may be ahead of the curve, but just six months after launching, the project is still in its earliest days. There remain legal impediments to data sharing that prevent the state from opening up its database to eager researchers. But officials are making progress. In the last month, Indiana said it, too, will integrate pharmacy records into patients’ electronic health records, so doctors can guard against so-called “doctor shopping,” when patients hop from provider to provider to get more prescriptions. Shah hopes that in the not-too-distant future, policymakers will be able to drill into the data and follow an individual through a potentially deadly journey, from their first prescription to, in some cases, death, and look for trends that show where the system may have failed them. Huntsinger takes that idea a step further, saying he envisions a day in which these agencies might actually be able to predict an individual’s risk of overdosing, so an addiction specialist could reach out to help. I graduated from the California Institute of Technology in 2003 with my bachelors in Computer Science. Since then I have worked with major software development firms and tech start-ups to hone my skills. But that wasn't enough; I wanted to do something more. I wanted to combine my passion for writing and technology and now I run the Modern Tech Insights blog.